Yesterday, my tires desperately needed patching from whatever it was I had put them through, so I took a trip to my local Walmart. Getting tires patched is usually a 5-10-15 minute job or so, so I didn’t anticipate much trouble or wait. However, it turned out that the wait was actually over 2 hours. Rather than spend that time shopping, I decided to walk. 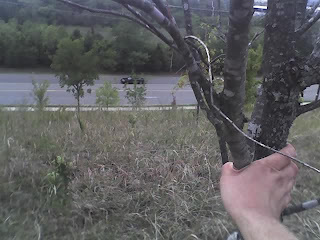 So, with a lunch bag (read, plastic Walmart bag) tied to my belt, I headed out, scouting out local shops and stores, climbing up and down some strange land formations, jumping fences, and the like. I realized a profound thing: our world is no longer made for people. It’s made for cars. And this led me to decide to venture behind Walmart itself. Now, venturing behind any big store always feels a little bit like trespassing to me, so I was cautious. But when I got behind Walmart, I discovered a giant man-made “mountain”. This mountain was designed, I decided, to segregate the nice neighborhoods from the sounds of Walmart. Once on top, I got an unique view of both the miles and miles of retail and road, and the interesting society of Walmart. 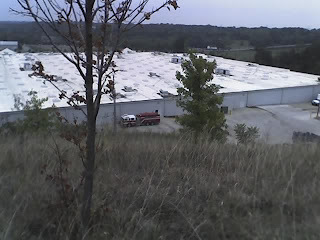 As soon as I got to the top, I heard sirens wailing, and a big fire truck pulled up behind Walmart. Firemen poured out and into the rear of the building, leaving the truck itself deserted. After watching this scene for a while and moving around the park-like environment on top of this mountain, I decided to come back down by a different way, and walked back through the parking lot. That was when I got a call telling me that Walmart hadn’t even been able to get the wheels off of my car.